4 parcels w/approx 170' ea frontage on St. Maybe sold lot 15 & 16 @$120,000. 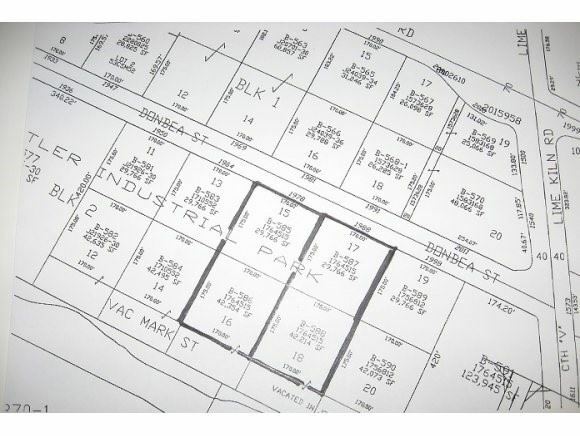 Lots 17 & 18 @$120,000 zoned light &/or heavy ind. Copy of permitted use avail upon request. Growing area waiting for your business or investment. Utilities water & sewer at lot line or across St accord to seller. Small part of back corner of Lot 18 may be wetlands. Hwy 172 to Lime Kiln Rd North to Donbea Street, West to property on left. $1,241 would be your approximate monthly principal and interest payment. Courtesy of: Province Builders & Realty, Inc.